One of Amber's absolute favorite topics to study is ancient history, specifically the ancient Greek and Roman eras. I've used her love of ancient history to motivate Amber through American history by giving her little respites along the way where she earns pieces of her Ancient World History credit before returning back to the much dreaded American History credit. This pattern has worked well so far, however a couple of months ago it was clear Amber was needing another little break and I was out of ancient resources. The main menu has an entry for Curriculum, where the three courses are listed. Each course then links to a listing of the individual lessons / videos. 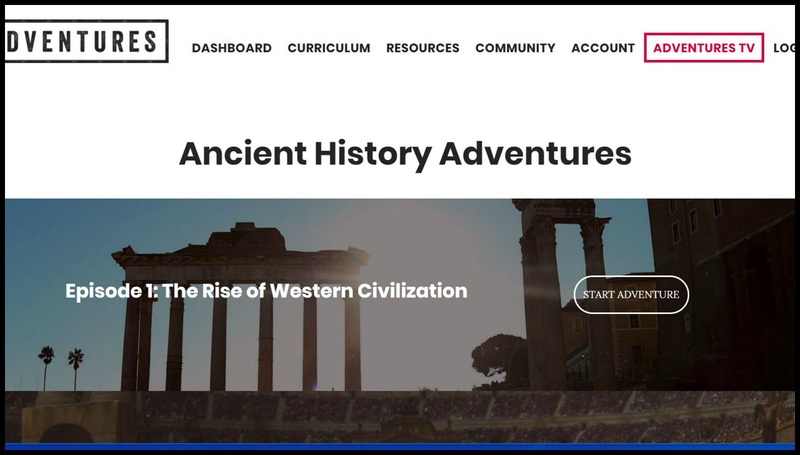 There is a button to "Start Adventure" for each lesson, and thankfully at the end of each lesson is there a quick way to continue on to the next. You do not need to return to the main menu each time. Once you have started an adventure, the whole curriculum for that lesson is set before you in order on the page. This includes the Drive Thru History video, additional reading, images, discussion questions, and dig deeper information. For example, let's take a look at the seventh lesson of Ancient History. 1. The curriculum page begins with the 45-minute Drive Thru History video, East Meets West. This can be viewed inline on the page, or made to be full screen. 2. Next is an applicable quote from the video and a summary of the episode in a paragraph or two. Interspersed on the lesson page are related art work images. 3. Suggested additional reading is then provided inline, and similarly to the video it can also be made full screen for easier reading. 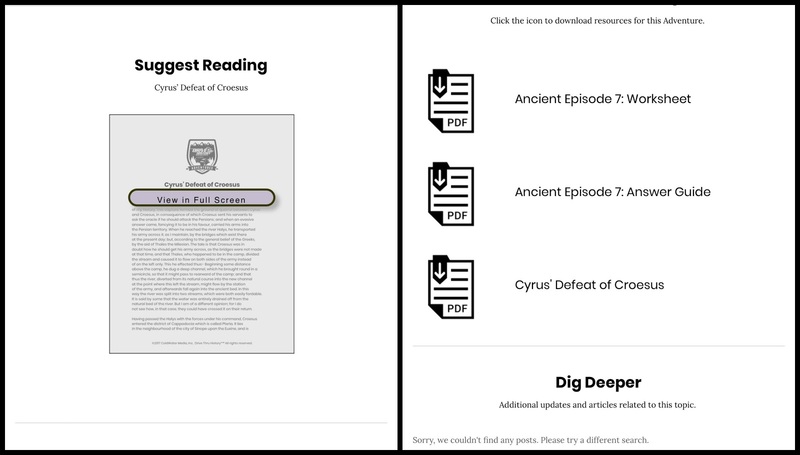 In the case of this episode it is Cyrus' Defeat of Croesus. 4. A Side Road article related to the topic of the video is printed to help students attain a better understanding of the era. 5. Discussion questions over the video that can be used in a group, written, or one-on-one. 6. Worksheet and Discussion PDFs are linked towards the end of the lesson. These are downloadable and printable worksheets with the answer guide as a separate file. Here you can also download / print a copy of the suggested additional reading that was available inline above. 7. 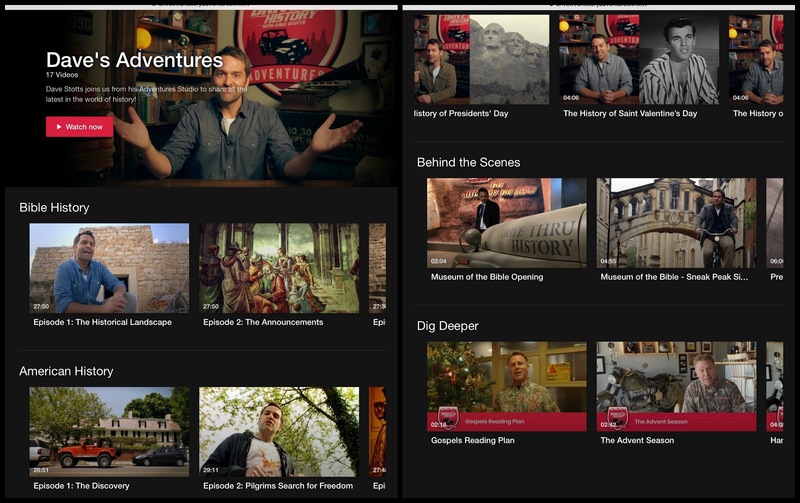 Lastly, some lessons have a Dig Deeper video or post that have been added specifically for Drive Thru History Adventures. There is also a tab for Community that links to the Drive Thru History Adventures Facebook group and displays the most recent posts. This is a fantastic community where members of the Drive Thru History Adventures team post, along with Dave Stotts. In this group members ask questions about the curriculum and can see updates of new videos posted to the Drive Thru History Adventures site. 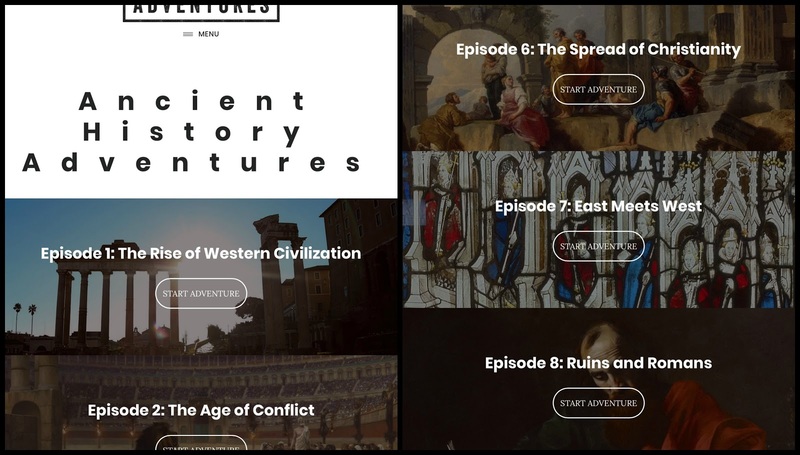 Adventures TV can be used on a computer / tablet device through a browser, or through their free app on both iPhone and Android devices. I installed the app on my iPad Pro to check for differences between using Adventures TV in Chrome on iPad and in the app. The app may have run a bit faster, but they are essentially the same, although streaming service does make it easier to access the videos on an array of devices. Amber was more than ready for a break from American history when we received our access to Drive Thru History Adventures. Although all of the courses would have been a nice change from her normal curriculum, we had gone through The Gospels DVDs (without the curriculum) less than a year ago, and Amber had used the American History videos on sick days back in October of this school year. Though without a doubt, she would have chosen the Ancient History course even if she had already seen those videos. 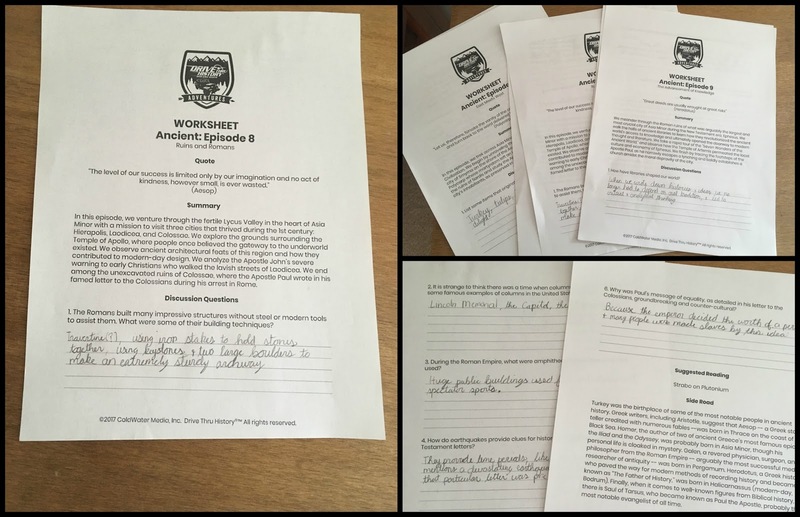 As I alluded to above, Amber has been working on her high school Ancient World History credit in pieces over the course of ninth and tenth grades. We have been keeping track of the topics covered and the time spent, while trying our best not to double up on topics through the variety of resources we are using. That means I paid close attention to the content in this course and documented every single thing she completed in the 12 lessons. For all but two of the lessons, Amber accessed Drive Thru History Adventures on my iPad Pro. To be honest, she was supposed to use her iPad Mini, but I was too lazy to go find my password the first time and Chrome on my iPad syncs across all my devices. After the first lesson, Amber was having fun using my iPad instead of hers, so I continued to let her use it. The last two lessons she did finally complete using the laptop through my account though, because again nobody wanted to walk the 10 feet to look up the password. For the most part, Amber was able to use Drive Thru History Adventures independently. During the majority of the lessons I was either in the same room listening, or nearby where I could hear the videos. 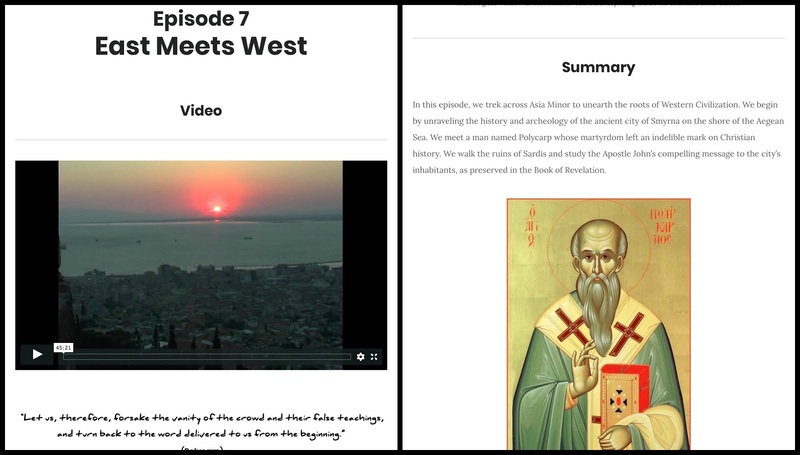 Each of the videos in the ancient history curriculum are roughly 45 minutes long, and include some outtakes that inject additional humor into the videos. 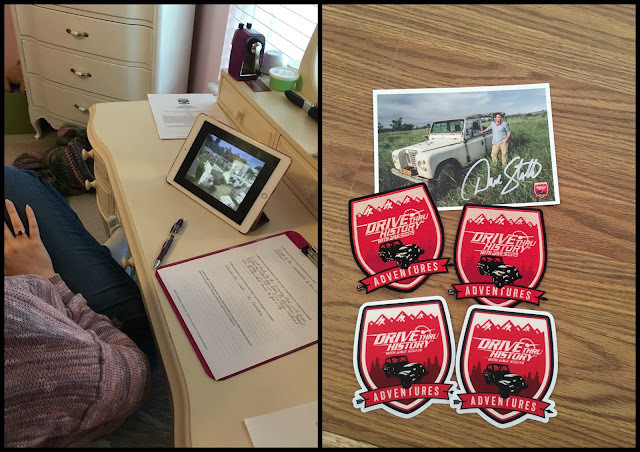 Amber worked on the printed worksheets while she watched the videos, which kept her mind from wandering and gave her the tactile experience she needs when using video components. She did have to pay close attention to the videos and occasionally repeat a section in order to properly answer the worksheet questions. The suggested readings were all of perfect length to keep her from becoming overly exhausted, and I printed these as well so that she would have better comprehension and retention than reading from an electronic device. At the end of her independent work, we went over the discussion questions orally. Although, they were a little redundant given the written worksheets she had already completed. Looking through the resources for the American History Adventures, I am considering having Amber go back and read through some of the suggested reading documents and Dig Deeper articles. Although the course only covers from the discovery by Columbus to the beginnings of the United States and Amber is well past that time period, she still will benefit from the extra information. I'm particularly interested in the Dig Deeper articles on Jamestown, Mount Vernon, Benjamin Franklin, and Groundhog's Day. The course instructions indicate the lessons are designed to take a week for the students to complete all the work. However, we did not find it to be a week's worth of history for Amber, who is in tenth grade. She completed all portions of each lesson in less than two hours. Since we minimally spend five hours a week on history, an individual lesson of Drive Thru History Adventures is significantly less than a week of history for Amber. Instead we used each lesson as a single day assignment and completed the curriculum in 10 days (she doubled on on a couple lessons during teacher sick days). Although Drive Thru History Adventures is geared to be used independently for older students or with teacher assistance for younger students, when part of a high school credit I would consider it to be a supplemental curriculum, or as in our case, part of a wide array of resources to create a high school level course. If you are not using Drive Thru History Adventures for high school, then it quite possibly could take a week per lesson, and thus 12 weeks to complete the entire course, making it suitable as a spine curriculum. Watching and working on her questions. Amber absolutely loved Drive Thru History Adventures! 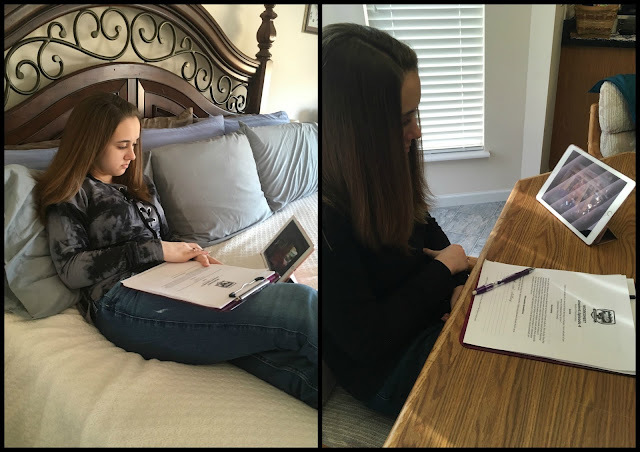 The variety of video, reading, verbal discussions, and written questions helped keep her focused and engaged. She loves the presentation style of Dave Stotts and can't get enough of Drive Thru History videos. Right now, receive a free DVD of The Gospels with a subscription to Drive Thru History Adventures. This offer cannot be combined with any other, and is offered directly from Drive Thru History Adventures. (Click here for more information and to subscribe). 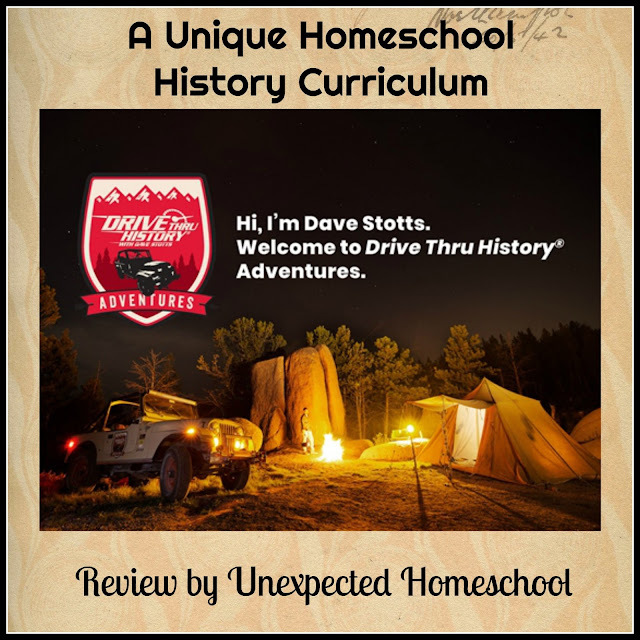 Other members of the Homeschool Review Crew also reviewed Drive Thru History Adventures. Please follow the link in the graphic below to read their thoughts. Drive Thru History Adventures is also offering a 20% discount for readers of The Old Schoolhouse® Magazine. Check out page 17 of the latest digital issue for more information. oh... so glad that Amber likes this program too. It's a good one isn't it?